Our final GOTM award for 2018 goes to Super Mario - Clone Race! 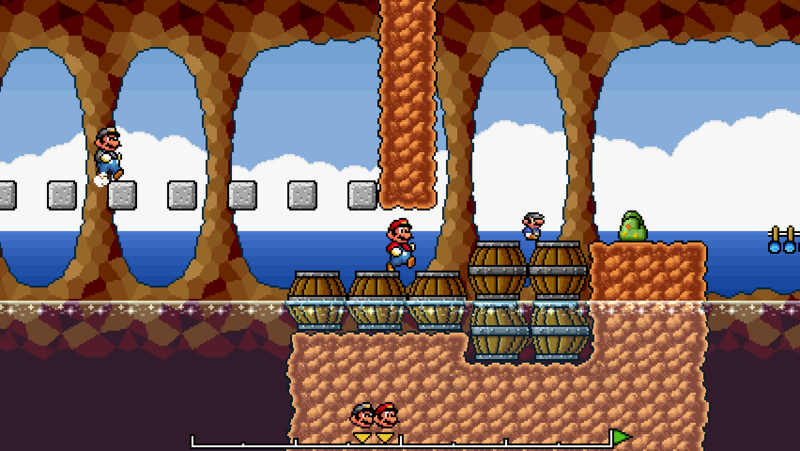 In this game, Mario races an evil clone of himself through 15 fun and challenging levels. If you reach the flagpole before the clone, you'll advance to the next level, but if the clone wins, you'll have to start the level all over again. These levels are often challenging, but never outrageously so. Just when you think you've gotten the hang of things, the game throws you a curveball by introducing a new mechanic. This helps each level feel fresh and fun. Super Mario - Clone Race is a reskin of a surprisingly polished joke game that Hypernova made for April Fool's Day, replacing the agents of totalitarianism with enemies that feel a bit more Marioish! The graphics include some of the SMB3 graphics we often see in fangames, but there's also a lot of original sprites and tiles, as well as a variety of well-executed graphical effects. For example, there's a cool underwater distortion effect, and some levels have fog. The game also offers a unique soundtrack - I bet you haven't heard these songs in other Mario fangames. I highly encourage you to give it a try! Mario might be racing against a clone, but the game is far from being a clone itself! Congrats, Hypernova. I gave this game a shot and it's really fun so far. Congratulations, @Hypernova! I haven't played it yet, but it looks pretty cool! Also, @VinnyVideo, I think Yakibomb (for his Ancient Shroomba) and Hypernova should get their GOTM badge. (01-25-2019, 12:01 AM)Q-Nova Congratulations, @Hypernova! I haven't played it yet, but it looks pretty cool! Thanks for the reminder! I awarded GOTM badges to @Hypernova and @Yakibomb. Maybe someday Firestyle will join so I can give him his November badge for Sacred Bells!